The report says that he took off with a tailwind - which would mean a lower takeoff speed, would it not? CM and others like-minded: I was a simple Met man. I watched the news that dreadful day, doubly dreadful because I am a Sussex man and know Shoreham and Lancing college well. Indeed as a lad I remember Miles Aviation and the old 1930s main building. So the simple ex Met man sees an aeroplane fly into the ground on a perfectly good weather day. It turns out that it kills and maims many people on a road that he knows well. What is he to make of it in his simple, ill-informed way? Pilot error, or unserviceability or a combination of both? I don't think many contributors above are attributing the tragedy to unserviceability alone. So to my simple mind the matter resolves itself into determining the degree of culpability, does it not? This is how I understand current RAF display pilots would do it-The current Typhoon Display pilot is down to around 1000ft as his base height as I understand and is now practising over CBY. He's spent more than 6h getting there though (how many more I'm not sure)-and of course he has much better synthetic training aids than you probably had (or a civilian pilot would have). And of course he flies the Typhoon as his day job....so no additional currency required either. No trap intended-and what you say regarding the cost of doing all this for a civilian pilot....hence a balance needs to be found for civilian display pilots? For me the key to this tragic accident is power reduction - especially in the first half of the looping manueuvre. No-one knows why this happened. In my opinion no display pilot whose brain is functioning normally would apply anything less than full power in the first half of a low-level loop - especially if entered slow. I believe something starts to go horribly wrong at 12:21:50, about 35 sec before impact. At this stage he had positioned nicely and needed to accelerate for a few more seconds before pulling up, power is around 7700 RPM, its a nice day, no cloud, off-crowd wind, Lancing college to the right, only 20 degrees to bend during the loop... then there is a power reduction to less than 7000 RPM... that does not make sense.. he needs to accelerate.. Just before pull up power increases to 7500, but then around 2 sec later it reduces to less than 6700 before increasing to around 7200.. this is a really strange thing to do, and, I believe, a highly significant event that led to the low energy state at the apex of the manoeuvre. I think it possible the pilot may have suffered some sort of transient 'cognitive impairment' .. Apart from the totally illogical power reductions, another clue for me is that with an off-crowd wind of about 15 Kts, with only 20 degrees or so to 'bend' - he rolled too much (about 60 deg) on the way up, that, too, does not make sense. A Transient Ischemic Attack could posibly explain this tragedy. A close relative of mine had one of these while driving a few years ago and described it as 'like waking up having just being born' while on a roundabout. It took about 20 sec to recover and never happened since. I believe the possibility should be considered. In simple terms, any culpability is for legal investigators to determine. It is not the remit of the AAIB and even less so of some armchair experts here who seem happy to assume they know more about the events than the AAIB team. From what I've seen in the various reports, there is too much stated doubt in the report at this stage to draw any legal conclusions. Despite the will of the people. Tailwind takeoff = same IAS, higher GS. Therefore more runway. Courtney - it is perhaps admirable the loyalty shown in playing devils advocate that very many possibilities are possible and actually the fact remains that all of this is "on the balance of probability". Few are calling for or would want the pilot to be prosecuted because it wouldn't really achieve very much and he is also a victim of the broader failures highlighted in the report. What sticks in the caw is this high ground that personally I think starts to become silly. From the outset of this accident hackles got raised if/when anyone dared to suggested the figure flown looked scruffy. You in particular threw a doubt over the start height being low by suggesting maybe you could pull up from a low pass and until the nose was x deg it wasn't technically aerobatic etc, etc. Regardless of wishing to discuss that now, nobody is racing to go on record with that defence and the BADA statement suggests that human factors trump technical ones. Page 29 of the report - picture. At X750 feet on the altimeter, the broader part of the needle obscures the thousands of feet and the tens of thousands of feet on the counter. a. The altimeter may not have been seen or read at the apex of the loop as a result of scan pattern, high workload, allocation of attention, distraction (for instance, from detecting a reduction in thrust during the climb or the airspeed being lower than expected), and/or visual limitations (such as contrast and glare). b. An inaccurate perception of aircraft height may have been obtained, specifically, that the aircraft was higher than it was as a result of the altimeter displaying the incorrect altitude, a misleading or ambiguous display of the altimeter digit drum [height counter], the altimeter digit drum [height counter] being partially obscured, and/or the altimeter being misread. c. The minimum height required at apex may have been recalled incorrectly. The point b. of the AAIB report isn't replicated faithfully however in your post. What it should show is this. "That the aircraft was higher than it was as a result of the altimeter displaying the incorrect altitude 61"
61 The RAFCAM report was prepared before the results of the altimeter testing were available. Overall, whether in servo or standby mode, the left altimeter would have indicated a lower altitude at the apex of the accident manoeuvre than the aircraft actually achieved. 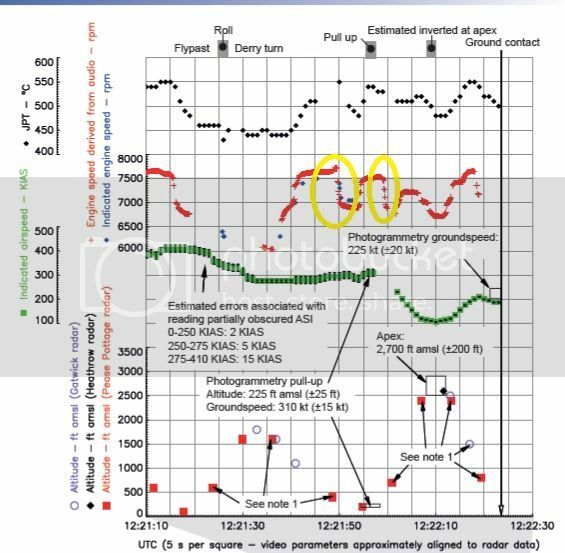 That is why I suggest the AAIB do not give greater emphasis to any altimeter issue in the overall summary to the accident. I can only speak personally but the legal conclusion is not a factor in any comments but the debate on things of a flight safety matter can be misdirected if focus is distracted on things that simply are less important than others. I registered specifically to comment on the AAIB report. I could not possibly comment on the aviation aspect as I have never flown FJ, but there are things in the report that concern me. It has been pointed out that the pilot started his "bent loop" way too low, too slow and with insufficient power applied, and no escape procedure was attempted. Likewise there seem to have been "strange" power variations after entry. I see from above at #164 "hum" has just beaten me to it, but I just wanted to say that the idea of a possible TIA is what occurred to me when I read the report. I have witnessed such an event [not in the air] on more than one occasion, and if I had not done so no-one would have been aware that it had happened. TIA is often called a "mini stroke" but stroke symptoms do not manifest. Hence video recording of the pilot would not necessarily show anything wrong. Extreme confusion lasting for a very few minutes was very disturbing, all the more so because there was no external physical sign of anything wrong. It was only confirmed later by a professor of vascular medicine [following Ultrasound, CT & MRI scans] that a TIA was most likely responsible. He further opined that it had left no trace and might never recur. unwell, or if this was his answer. I'm perhaps the least qualified person here to suggest the cause or causes of the accident (though most accidents turn out to be a sequence of problems not a single factor). I've read the report in full twice and (I think) every post so far on this thread, carefully. Eleven unconnected people were killed. Whether they were unlawfully killed is for the Coroner. As an engineer (and low hours PPL) I understand Newton's Laws as they apply to aircraft. Whether the aircraft had structural 'failure', power 'failure', instrument 'failure' or whether the pilot had mental or physical 'failure' it is perfectly predictable that a large mass will continue in the same direction unless another force is applied. The eleven people were killed because a large mass travelling at high velocity, laden with kerosene smashed into them. That was clearly the 'CAUSE' of the deaths. Certainly all the pilots on this thread will follow the argument that the vectors of all display aircraft should be calculated before the display is approved. It is very easy to do mathematically. I suggest that there have to be special and compelling reasons to approve a display that has a proportionate chance of anyone being harmed if the pilot or the aircraft fail at any stage in the display. One poster earlier mentioned Farnborough. Good point. Maybe that's an exception, not my call. Of course Blackbushe is practically in the circuit as is Lasham. Hum, I agree. I don't understand why anybody would want anything less than max thrust in the first part of a loop unless they are extremely fast to start with. Which he wasn't. You ensure you get the energy, assess at the top, and fly accordingly. Also this was a fast jet display, and noise is part of the show. Its almost mandatory to have max noise at the appropriate time for the crowd. Which this was. 6700 - 7200 is a long way back on the thrust lever. To state the obvious, that was either pilot instigated, or a mechanical problem. If a pilot issue, I really can't understand why. Would a tailwind not mean a higher groundspeed required? It should not however affect the airspeed required at take-off. The report says the pilot lifted the nose at 112 knots instead of 120 knots. It does not speculate why, simply saying before that the take=off was longer than usual due to high air temperature & tailwind. H Peacock, thank you. Biscuit74, Yes, it does. Getting back to the possibility of confusion between types (Hunter and Jet Provost), would 112 kt be an appropriate take-off speed for the Jet Provost? Could the pilot's mindset have been that he was flying a JP display even at this point? Since I was here and intrigued see https://www.flightglobal.com/FlightP...20-%202210.PDF all depends on the variant and other factors. That's why aircraft tend to take off into wind. Pittsextra, I'm probably not going to address your accusations point by point at this to,e of the evening, Pittsextra. The block you repost was simply a copy and paste, so, if you think it's not faithfully replicated I can't really help you. The process of summarising long reports is not something we have discussed before, but I do recall your lack of experience in the process of compiling the reports and investigating the incident. Similarly you are now simply searching for points to argue (as you did before), but the STBF altimeter mode is unlikely to be of much significance apart from the fact that, due to lag, it would still have been indicating that the aircraft was still climbing at apex. I have no idea of the relevance of that because that was no commented upon. The only places I have commented upon as being incomplete where areas where the report refers to "further investigation" whose conclusions have not yet been declared. I did not choose to search through the 452 pages in order to give you a reference because I was still reading it and also answering other people's questions elsewhere. You are not the only person asking me for help with this. I'm sure you finally managed to work it out for yourself. The last thing I will discuss with you here is that your position has been very clear for 18 months. If you wish to take issue with the AAIB, the owners, the engineering and regulatory authorities, be my guest. Not my area. I can only comment on fast jet aeros, high performance operations and jet technical matters and, as you will see from my posts in this threat, that is what I limit myself to here. CM - dismal, just dismal.
" He could not explain lots of things because he received injuries in the crash, was placed in an induced comma and has suffered PTSD and memory loss. It implies nothing, but you are inferring more than you have evidence so to do." As a medical fact, an individual cannot suffer from PTSD unless he has full recall of the incident. That is one of the primary pre-conditions for the diagnosis. This is set out in DSM V (in full the 5th edition of the Diagnostic and Statistical Manual of the American Psychiatric Association-the bible of all psychiatric illnesses). He may well have other conditions but he cannot suffer from PTSD if he has no recall of the accident.